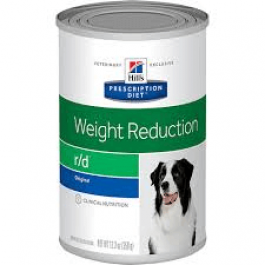 Hill's Prescription Diet r/d Canine is recommended for obesity and fibre responsive diseases in overweight dogs: diabetes mellitus, hyperlipidaemia,colitis and constipation. This is clinically proven nutrition for healthy weight loss in just 8 weeks. Low fat - stored body fat is used to meet energy needs, resulting in weight loss. High fibre -&nbsp;provides increased dietary bulk which aids satiety and avoids hunger. L-Carnitine - facilitates conversion of fat to energy and helps maintain lean body mass. L-Lysine - helps preserve lean muscle mass. Superior antioxidant formula - helps neutralise free radicals that increase in obese animals. Pork, vegetable fibre, ground rice, pork liver, cellulose, soybean meal, iron oxide, digest, vegetable oil, calcium carbonate, dicalcium phosphate, iodised salt, taurine, L-carnitine supplement, vitamins and trace elements. 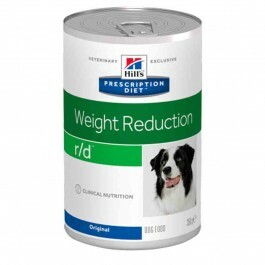 Hill's Prescription Diet r/d Canine should be recommended by your veterinary surgeon. For detailed information on feeding amounts and how this food can help your pet, please consult your veterinary surgeon. Exclusively feed the recommended Prescription Diet food and keep fresh water availalbe at all times. These ranges are a starting point only because dogs' needs vary. Adjust the feeding amount as necessary. To correct obesity, the amount to be fed should be based on the estimated ideal weight (target weight) and not the weight when obese. After reaching the target body weight, a dog should be fed Prescription Diet w/d Canine to maintain its ideal weight. In case of mobility problems, Prescription Diet j/d Canine Reduced Calorie can be given. A 350g can is equal to 85 grams of the dry food.